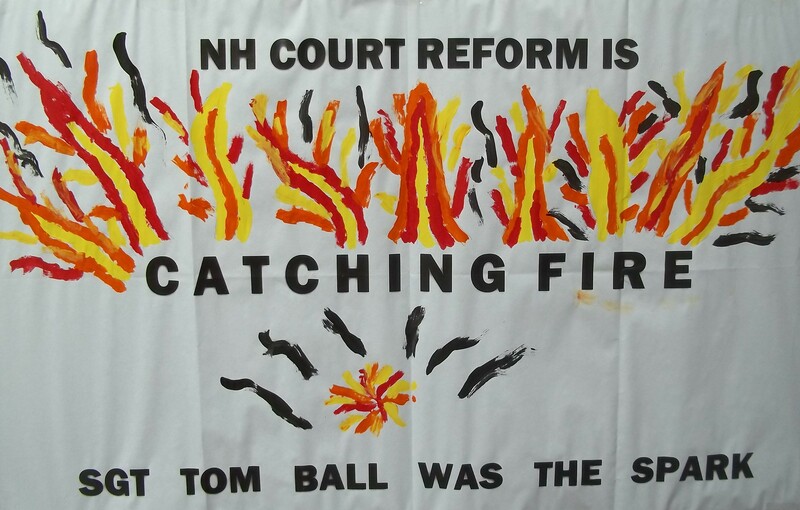 Poster at a memorial event for Tom Ball, an MRA who advocated burning down courthouses and police stations. EDIT 6/15/13: Tom Ball’s manifesto is no longer posted on A Voice for Men, though it isn’t clear if this is a website glitch or a change in policy on AVFM’s part; no announcement about taking it down has been made. EDITED TO ADD: In the wake of the Boston Marathon bombing, it seems even more important to reinterate that influential Men’s Rights website A Voice for Men continues to host, in its “activism” section no less, a terrorist manifesto literally calling for the firebombing of courthouses and police stations. Until and unless that manifesto is removed, and A Voice for Men apologizes for hosting it, I will be linking to this post every time I mention A Voice for Men. There has been another courthouse shooting. On Monday morning, the father of a man due in court for a child support hearing pulled out a semiautomatic handgun and shot his son’s ex wife and a friend of hers as they entered the lobby of the New Castle County Courthouse in Wilmington Delaware. After an exchange of gunfire with police that left two officers wounded, 68-year old Thomas Matusiewicz took his own life. The two women Matusiewcz shot were pronounced dead on arrival at a local hospital. His son, David Matusiewcz, had earlier served time – an astonishingly short amount of time – for kidnapping his three girls and hiding out with them in Nicaragua for a year and a half. More details on the case here, here, and here; further news coverage here. Unfortunately, despite increased security, violence in and around courthouses has been on the increase. There have been numerous courthouse shootings and other violent attacks across the country in recent months, from Texas to New York to Washington state. Sometimes the victims are family members; other times they’re prosecutors or judges. That’s why it’s so worrisome that A Voice for Men, the leading Men’s Rights site outside of Reddit’s Men’s Rights subreddit, continues to host a terrorist manifesto urging Men’s Rights activists to literally burn down courthouses and police stations, even if doing so means that people are killed. The manifesto, which I have written about several times previously, was written by a troubled man (and an admitted child abuser) named Tom Ball, who burned himself to death on the steps of a courthouse in New Hampshire in hopes that his death would inspire a wave of arson against courthouses and police stations. Dictionary.com defines terrorism as “the use of violence and threats to intimidate or coerce, especially for political purposes.” And that is precisely what Ball’s manifesto advocates. You need to flatten them, like Wile E. Coyote. They need to be taught never to replace the rule of law. BURN-THEM-OUT! Several paragraphs in this copy of Mr Ball’s original letter have been omitted. The omitted paragraphs contained detailed instructions on the manufacture and use of simple incendiary devices. Yes, that’s right; Ball’s original manifesto included specific instructions for constructing effective Molotov cocktails, a pretty clear indication that there was nothing figurative about his calls to “burn them out,” and that Ball literally hoped that his death, and his manifesto, would encourage a wave of arson. Indeed, that it would be the start of a literal war of Men’s Rights Activists against the US government. I only managed to get the main door of the Cheshire County Courthouse in Keene, NH. I would appreciate it if some of you boys would finish the job for me. They harmed my children. The place is evil. So take it out. Now, the official stance of the AVFM crowd is that they don’t support such violence – that they’re just predicting that more of it will occur. Thomas Ball represents a tragic, dysfunctional reaction to chronic, systemic abuse. There are many possible reactions. Some even worse than his. And while we cannot, must not, condone violence, we had better learn to expect it as long as an ideological war against men is allowed to make a battlefield in our justice system and within the heart of our own families. Then why, Paul, do you feature his manifesto in your “activism” section, alongside a link to AVFM’s “Judicial Accountability Committee?” Why do you continue to lionize the man and treat him as a martyr? I am a pacifist. I do not advocate violence. But I tell you this. The day I see one of these absolutely incredulous excuses for a judge dragged out of his courtroom into the street, beaten mercilessly, doused with gasoline and set afire by a father who just won’t take another moment of injustice, I will be the first to put on the pages of this website that what happened was a minor tragedy that pales by far in comparison to the systematic brutality and thuggery inflicted daily on American fathers by those courts and their police henchmen. It would not even so much be a tragedy as the chickens coming home to roost. And it is certainly less of an indecency than the suicide of Tom Ball. This is from a man who evidently considers himself some kind of 21st century Gandhi. AVFM is not the only Men’s Rights site to lionize Ball; he’s been hailed by numerous MRAs, and his manifesto (in its entirely, including the Molotov cocktail portions) has been reposted all over the internet. Indeed, some MRAS have constructed an elaborate site memorializing him and his alleged heroism. A year after his death, Men’s Rights activists organized a “memorial” protest. He’s even been remembered in song. His statement is not the ramblings of a madman, it is the mission of a warrior in some sense. He was fighting for his rights and for yours, if you are male. He was trying to bring some urgency to the male plight in this country, one that no one appreciates or cares about until they are engaged in the battle of the courts. You can find more discussion and lionization of Ball by MRAs, Fathers’ Rights Activists and others here, here, here, here, here and here. A few minutes with Google will turn up numerous other examples. Why do I continue to hammer on about Ball’s manifesto? Because so many in the Men’s Rights movement are motivated primarily by anger and hatred — of women, of feminists, and of those, like judges and police officers) that they see as feminist “quislings.” Because so many in the Men’s Rights movement – like the prolific writers and videomakers associated with AVFM – stoke this anger and hatred every chance they get. It seems almost inevitable that at some point some especially angry and unbalanced Men’s Rights Activist will resort to violence – as MRAs like Elam have “predicted” again and again. (Indeed, we’re probably lucky that Ball did not choose to “take out” others before taking his own life.) This violence may well be directed against a judge or prosecutor or some other official seen as a feminist or feminist “collaborator.” When and if this violence occurs, no doubt the folks at AVFM will officially “lament” it – and then come up with elaborate explanations as to why it’s all really the fault of feminists. Indeed, in the posts of his I quoted above, Elam has already written what are in essence apologias for this violence, even before it has happened. If the Men’s Rights movement wants to be seen as anything other than a hate group, MRAs need to stop lionizing the author of a terrorist manifesto, and they need to start criticizing those in their movement who make excuses for the violence that they so often warn us is inevitable. Did someone necro a thread? Well, at least the scare quotes around “Counter Terrorism Movement” are appropriate. While we’re here, it appears that the link to Thomas Ball’s manifesto has been removed from A Voice for Men’s Web site, hasn’t it? Is that a recent development? Anyone know the story behind that? Is there one? For perspective, you might want to look up the tale of Angela Davis and the response to those events.